I had the privilege of spending four months in New York City last fall, working with the Titan Theatre Company, a classical theatre company based in Queens. 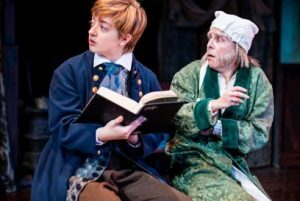 In my time with Titan, I helped set up a fundraising gala, understudied roles and worked on the set and costume designs for their production of The Tempest, and worked on the costumes and performed in their production of A Christmas Carol. I met Lenny Banovez, the artistic director of Titan, through Hope Summer Repertory Theatre (HSRT) in the spring of 2018. (Lenny is also the artistic director for HSRT so he was on our campus last spring to get ready for summer shows.) I knew I would be spending a semester in New York with the GLCA New York Arts Semester, a program Hope has had a long association with, so I got up the courage to asked Lenny if I could work for Titan. I am so happy that I took that small risk. Working for a smaller company like Titan gave me opportunity to use all of my theatre skills, from costumes to performing, and allowed me to work closely with their entire team, from the artistic director to the general manager to the artistic associate. My experience ended up being so personalized to me, and I gained so many friends and professional connections through the process. I quickly fell in love with New York bagels and the busy sidewalks, and found my routine of daily errands, internship tasks and night-time rehearsals. Moving to New York from West Michigan was definitely a big transition. I was definitely a little scared when I showed up at LaGuardia Airport in Queens with two bags, my backpack, and myself. From grocery shopping to getting a cup of coffee, life just looks different in New York. I had to learn how to navigate subways and buses, and I walked more than I ever have in my life! I quickly fell in love with New York bagels and the busy sidewalks, and found my routine of daily errands, internship tasks and night-time rehearsals. Having the opportunity to go to New York for four months and only focus on theatre was such a gift, and I’m so grateful to Hope College and the New York Arts Program for enabling me to do this. My NYC internship was perfect to round out my college career as I was able to put to work all the skills I have learned with my Hope theatre education. Being in NYC also allowed me to bring back some knowledge and experience about the “real world” and share it with my friends and classmates, such as what going to Broadway chorus auditions looks like, or the best place to get soup dumplings. A highlight of my time in New York was working on A Christmas Carol. A guest director, Tony Clements, came in to work on the production. Getting to work with a director and actors who have Broadway credits was such an incredible experience for me as a student, and as an actor looking to work in the field. I learned so much just by watching them work in rehearsal, whether I was onstage with them in a scene or not. We were lucky enough to sell out most of the shows for A Christmas Carol, and it was an experience I will never forget. 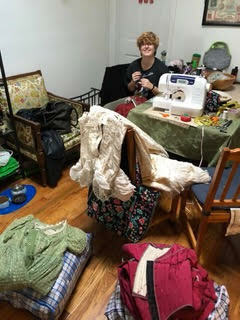 From hemming tablecloths to sewing rope onto sails to performing, I got to experience every part of what it takes to put up a theatre production in a small New York theatre. I am so grateful for what the New York Arts Program and Titan Theatre Company helped me do this past semester, and I’m hoping to go back to New York soon! 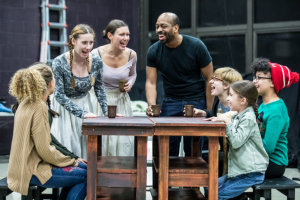 Editor’s note: At the regional Kennedy Center American College Theatre Festival held in Madison, Wisconsin earlier this month, Katrina won a regional Theatrical Design Excellence award for her costume design for Hope’s production of Shiloh last April. As a part of this honor, she is invited to attend the national KCACT Festival in Washington, D.C. in April. She has also been cast as Nina in Hope’s April production of The Seagull so it will be a busy semester for her!